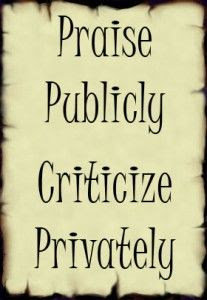 Have you ever heard the phrase "Praise publicly, Criticize privately"? I used to work at a facility that had this posted on the wall in the employee break area. It sounds very cute and fluffy, right? It's actually more insightful than you may think. I think the meaning behind "criticize privately" is so you can take your time and incorporate modeling, role play, and active discussion when giving corrective feedback. In other words: view deficits as areas where further teaching is needed, rather than an attack on the person. Whether you found your way to this blog as a parent, teacher, or ABA professional, you need to know how to motivate individuals, as well as how to improve performance. If I always gave my staff glowing reports, how could they grow? How could they ever sharpen their skill set unless I help them identify the dull areas? What about if I constantly gave them corrective feedback? How would they know their strengths and where they shine (I regularly interview/meet new staff who cannot identify their own strengths, and its usually because they have had experiences with really poor leadership). Also, think about how aversive I would become to staff if I only said things like "Here's whats wrong with what you just did........". So its necessary to give both the sweet and the sour, in order to teach and in order to have excellent staff. This article gives some solid tips on ways to make the most out of your criticism, I also recommend reading this post.